Sandia Cooler: Air Bearing Heatsink Prototype - 2014 Update! Abstract: Unlike traditional CPU coolers, heat energy in the Sandia Cooler is conducted across a very thin air gap bearing from the stationary base of the cooler to the upper rotating aluminum fin/fan component. An update on the revolutionary Sandia Labs Air Bearing Heatsink (aka Radial Sandia Cooler) just landed in my inbox... more to come. You can read the 72-page "Market Assessment and Commercialization Strategy for the Radial Sandia Cooler" document right here. 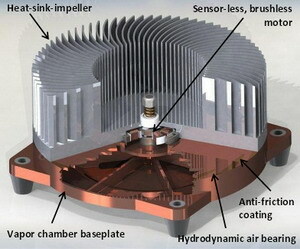 Recently, a few curious Frostytech readers have asked; "what's happening with the Sandia Air Bearing Cooler?" That's a good question. We made some inquires and have a bit of new information to share. In case you missed Frostytech's original story, the Sandia Cooler is a novel heatsink under development by researcher Jeff Koplow at Sandia National Labs in Livermore, California. What makes this prototype heatsink special is the design, its aluminum cooling fins serve double duty as the rotating fan and fan blades of the cooler . Unlike traditional CPU coolers, heat energy in the Sandia Cooler is conducted across a very thin air gap bearing from the stationary base of the cooler to the upper rotating aluminum fin/fan component. This aspect of the novel cooler design tends to challenge people's expectations as it seems impossible for a heatsink to work this way. What's new? For starters, as of late August 2013 development of the v5 Sandia Cooler continues. The research team are currently testing modifications to the controller board and working to mature several aspects of the technology in preparation for the next phase. Secondly, the researchers have asked to address some misconceptions about the underlying capabilities and technology in the Sandia Cooler. Please note that Frostytech hasn't tested the heatsink, nor even handled a unit yet. The most common misconception seems to be that the Sandia heatsink only works in a horizontal orientation. In the YouTube video released by Sandia the cooler is demonstrated like this, so it seems reasonable to assume the air bearing heatsink only operates on a horizontally plane. Yet as we all know, most computers have the motherboard vertically oriented... According to the developers, the Sandia cooler is in fact orientation agnostic - meaning the air bearing is not affected by gravity and the spinning aluminum fins will operate vertically, horizontally, upside-down or at an angle. A compression spring is used to hold the impeller and base together, not gravity. Several of the more frequent misconceptions about the Sandia Cooler are addressed below by Jeff Koplow, lead researcher for the project. Danger Danger! The 150-gram, 2500-rpm, rotating aluminum heat-sink-impeller must be a safety hazard. Actually, you can run your fingers along (the aluminum fins) while it is operating at several thousand rpm and nothing happens. Note the backward swept orientation of the fins. It's like running your hand along a picket fence. In the production unit, some type of screen/grill would be incorporated. An Impossible Thermal Design - Common sense dictates that heat cannot be effectively transmitted across an air gap. Many people have made this statement categorically. 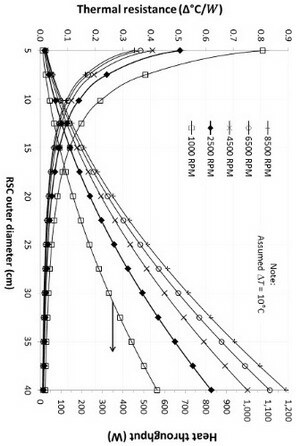 Some perceptive readers have commented that the thermal resistance of the air gap should be inversely proportional to air gap distance, so if the air gap distance is small enough, the thermal resistance should be low. This is a critically important point, but it is only part of the story. Air gap area is critical as well. The need for thermal interface materials such as heat sink grease arises in part because the geometric contact area of thermal joint at the CPU is quite small in absolute terms. Moreover, the CPU die is considerably smaller than the CPU heat spreader, making the effective contact area due to non-uniform heat distribution even smaller. The area of the air gap region in the Sandia Cooler is huge in comparison, about 7,000mm2 in the current 100mm-diameter prototype. In addition, the air that resides in the air gap region is not stagnant, it is violently sheared, which significantly enhances heat transfer. Hype: Claiming the Sandia Cooler is 30X more efficient than conventional heat sinks strains credibility. I couldn't agree more. If you think about it, what on earth does "30X more efficient" mean for a heat sink anyway? What we measured in lab was 30X as much heat transfer per unit fin area compared to a conventional heat sink ; this illustrates the boundary layer thinning effect of the sandia cooler. Somehow this result was misinterpreted as "30X more efficient" and went viral. The Anti-Dust Heatsink: Claiming that no dust accumulates on the heat-sink-impeller because it rotates at high speed is extremely dubious. The finned heat sink is completed choked with dust. But only a few percent of the surface area on the rotating fan blades is covered by dust. Now imagine that your objective is to cool the rotating blades, as is the case for the Sandia Cooler. The reduction in cooling due to dust fouling experienced by the rotating fan blades would likely be small enough that it would be difficult to measure, in which case it would fair to say the effect of dust fouling is negligible. In contrast, nearly complete clogging of a conventional stationary finned heat sink is inevitable. Whether a device that suffers no measureable ill effects from dust under typically operating conditions is referred to as "resistant" or "immune" to dust fouling is a matter of opinion. Also, certain types of very sticky or fibrous dust would be more challenging. It will be interesting to see in practice how much of a benefit will be conferred to the end user by this dust fouling resistance effect. Keep in mind that a light 0.05 C/W coating of dust might not be a big deal for 0.5 C/W heat sink, but it is a big deal for a 0.10 C/W heat sink, and likely a deal breaker for 0.05 C/W device. Thus future progress in air-cooled CPU heat sinks will make the dust fouling issue increasingly important. The point of this three piece, prototype spinning aluminum impeller heatsink is to get rid of boundary layers by exploiting a fairly obscure fluid dynamic effect first discussed in the 1950's; boundary layers are substantially thinned above the surface of accelerating bodies (ie. radial fins on a disk rapidly spinning). In this case, the aluminum cooling fins - the fan impeller - are spinning at 2000RPM. According to Sandia Labs, heat is transferred from the processor to the rotating cooling component across a very thin 'air bearing' - essentially a metal surface rotating a fraction of a millimeter over a similarly sized stationary surface. Watch the entire YouTube video on the Sandia air bearing cooler, it's well shot and explained in laymen's terms. 1: — Sandia Cooler: Air Bearing Heatsink Prototype - 2014 Update! List all Sandia Labs heat sinks that Frostytech tested?